Our Autumn Graduate Jobs and Internships Fair takes place on Monday 12th October from 11am-3pm at The Edge. There are over 120 organisations attending from a whole range of sectors. This is a fantastic opportunity for students, at all levels, to find out about opportunities with these organisations and to make a good first impression. This post provides tips and advice to help you get the most out of it. Attending a large recruitment fair, particularly for the first time, can be daunting. 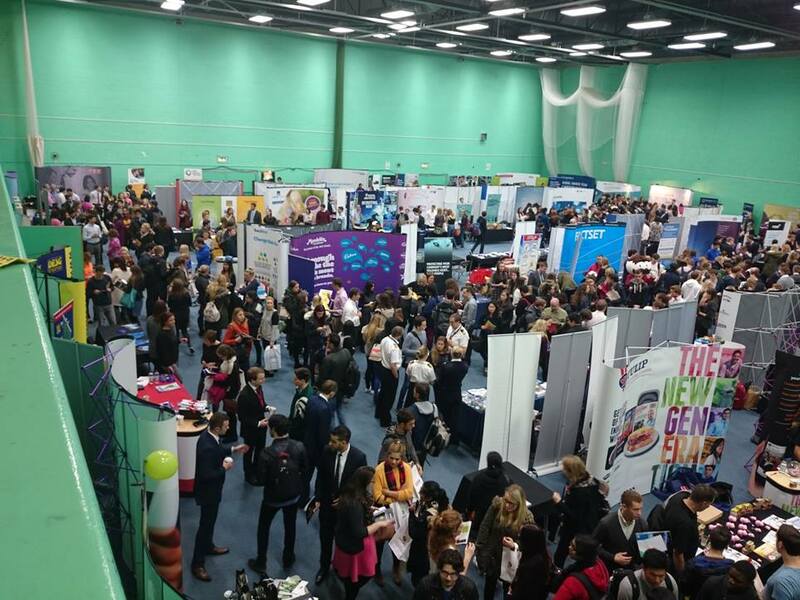 Remember that all the organisations are there because they want to meet Leeds students, so try to relax and take advantage of the opportunity to speak to recruiters and those who are doing the job at the moment. The video below (taken from our Yorkshire Graduate Recruitment Fair last summer) provides a great overview of what to expect, as well as comments from recruiters, students and graduates on why they found it useful. There is a full list of all the organisations attending on the event page on STARS. Use this to research the organisations and the opportunities they have. Make sure you take a look at the “Fair Guide” (available under the list of organisations on the event details page of STARs). This tells you where you will find each organisation and the types of opportunities they have. Note that the guide was correct at the time of going to print, more organisations have since been added, details of which you will find on the organisation listing on STARs. What is a typical day/ week/ month like for you? Why did you choose this organisation? What do you like most/ least about your role? What makes applicants stand out for you? It is a good idea to spend a bit of time reflecting on the skills, experience and achievements that you have to offer before attending the fair. Being able to succinctly outline what you have to offer them is a great way to stand out from other students. Doing this in conjunction with research will enable you to target your approach to the specific organisation on the day. But don’t just take our word for it; see these employer tips for approaching stands at careers fairs. Approaching stands at a fair can be daunting, but again, it’s a case of remembering that they are here as they are interested in speaking to students like you. Preparing beforehand will help you feel more confident on the day and taking the time to speak to recruiters can really help you stand out in subsequent selection processes. Many organisations will keep a note of students who have particularly impressed them on the day so use this to your advantage. Check out these posts from other students and graduates who found success from attending fairs and other employer events. If you are interested in reading more, can see all of our fairs and events related blog posts here. You’ve probably heard the phrase ‘dress for the job you want, not the job you have’; this is a great piece of advice for attending fairs. Whilst it is by no means essential that you dress formally to attend the fair, doing so is an easy way to set yourself apart from your peers. First impressions really do count and dressing smartly conveys a sense of professionalism and that you are taking the opportunity seriously. This will instantly make you stand out as the majority of students tend not to dress formally to attend fairs. Being prepared and planning which organisations you wish to speak to beforehand is definitely a good move. However, it is also a rare chance to get a feel for other opportunities which you may not even have considered. Use any spare time you have (for example if the organisation you want to speak to is busy) to find out what other types of opportunities are available: you may stumble across something amazing that you never would have considered otherwise. 6. Should I take a CV? It can be helpful to take along some copies of your CV in case an employer asks for one, or as a way to help them remember you. It is worth noting however that most employers attending will have a standard application process, so don’t expect to be hired on the day as a result of your CV alone. If you are taking copies of your CV, do try and target it towards the type of roles in which you are interested so that it highlights your most relevant skills, experience and achievements. There is lots of advice on CVs on our website and you can also get this checked at by us beforehand. Drop-in is likely to be very busy this Friday afternoon and on Monday morning so we would suggest not leaving it to the last minute if you would like your CV checked before the fair. This is a great opportunity to meet representatives from a whole range of organisations. Many of those representatives will have been in your shoes very recently so will know how you feel. They are attending as they are interested in meeting students like you so take time to prepare, then relax and most of all, enjoy it!